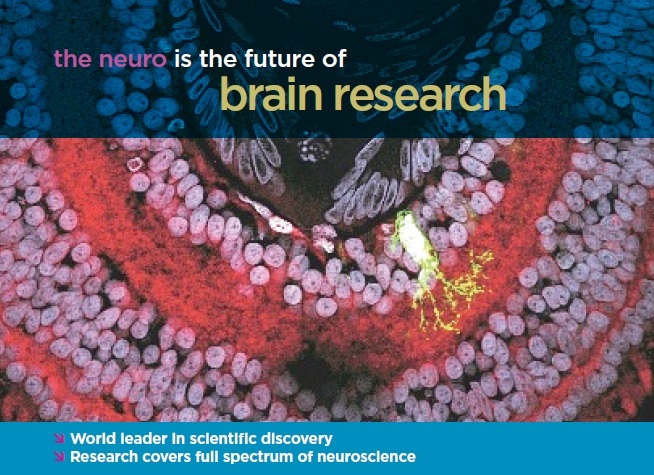 Researchers at The Neuro are world leaders in cellular and molecular neuroscience, brain imaging, cognitive neuroscience and the study and treatment of neurological diseases and disorders. At The Neuro, bench meets bedside. More than fifty-five faculty members lead international research teams that generate research and translational support from local, national and international agencies and private donors. The Neuro’s multidisciplinary teams, including an additional 220 academic staff, generate fundamental information that spans the full spectrum of neuroscience from cell and molecular biology to brain imaging and cognitive neuroscience. Over 300 graduate students and postdoctoral fellows from around the world pursue scientific training at The Neuro each year. The Neuro has an impressive cumulative institutional H-index of 444.